Some might argue it still doesn’t matter, and they could be right. Oklahoma State University is home to America’s Greatest Homecoming Celebration. But, on Saturday, tragedy struck the Cowboys again. Around 10:30 a.m., Adacia Chambers, 25, allegedly drove her vehicle at a high rate of speed into the crowd at the end of the parade route, at the intersection of Main Street and Hall of Fame Avenue, just two blocks from Boone Pickens Stadium. Four are confirmed dead, including a two year-old boy. About four dozen more are hurt, several of whom are in critical condition. There was talk to cancel the game. Sure, both teams are off on Dec. 5, but who cares? Football doesn’t matter. What mattered is how one community came together at a time in which it needed to more than ever before. Oklahoma State has been struck by tragedy before. On Jan. 27, 2001, one of the men’s basketball team’s planes crashed in Colorado following a game against the Buffaloes, killing 10. In November 2011, the night before the Cowboys lost to Iowa State to end their National Championship hopes, another plane crash killed four, including women’s basketball coach Kurt Budke. The difference this time, it was in OSU’s back yard. 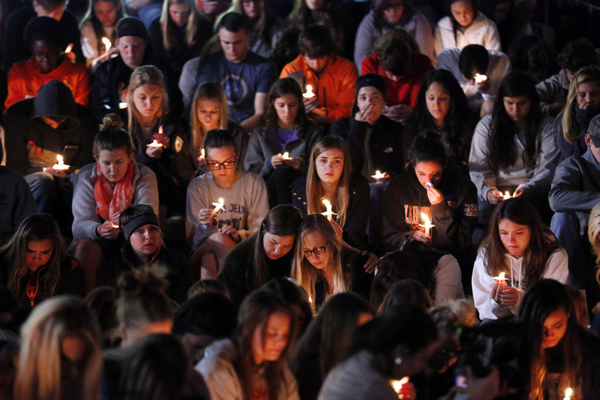 This time, when tragedy struck, it was right there in Stillwater. This time, when tragedy struck, it was at one of the most beloved events during the OSU school year. It was a time for celebration and a time for gathering with friends, family, loved ones, anybody. Then it turned into a time of grieving. The game was somber. What had just happened was lingering in the air. Then there was a football game, but it didn’t matter.